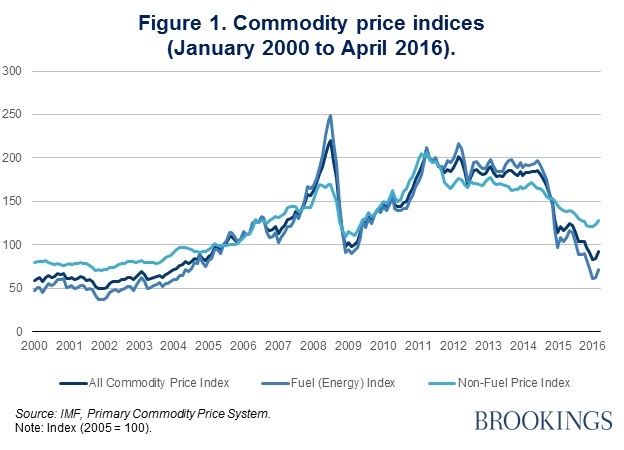 The onset of low oil and other commodity prices in 2014 (see Figure 1), compounded with China’s slowdown, more restrictive global financing conditions, and domestic structural challenges, have elicited mixed reactions from the financial and foreign exchange markets of Africa’s major economies. To better understand these market trends—their underlying determinants as well as their implications for the continent—the Africa Growth Initiative has launched a new blog series called the Africa Growth Initiative Markets Monitor, which will provide regular updates and analysis on the latest developments in African stock and bond markets, credit ratings, and currencies. The Africa Growth Initiative Markets Monitor aims to provide up-to-date financial market and foreign exchange analysis for Africa watchers with diverse economic, business, and financial interests in the continent. It may be useful for investors and businesses wishing to assess the short-term risks and potential return on various investment opportunities. Or it may help them gauge the expectations of business performance in the region and its major economies. It may also assist African policymakers to anticipate borrowing costs through its bond market data, while commodity price trends may help highlight threats to government revenues and foreign exchange reserves in countries dependent on exporting or importing commodities. 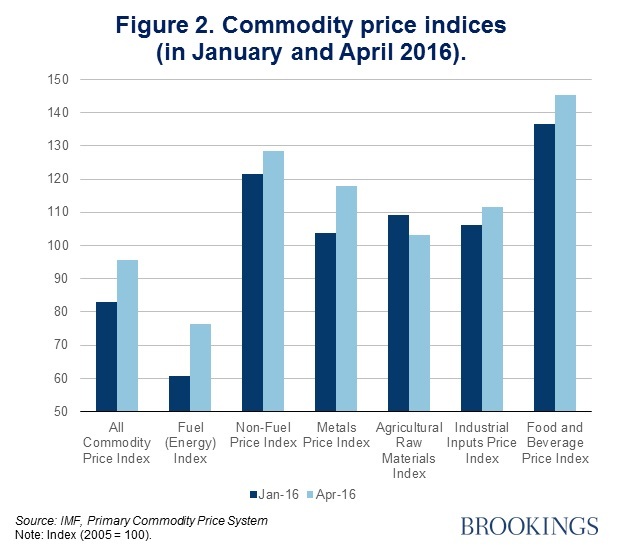 For households in Africa, the foreign exchange data offers an indicator of how much accessing imported goods and foreign currency will cost, which influences consumption and spending habits. Emerging market stock exchanges generally suffered under the aforementioned global constraints since the beginning of 2015, as indicated by the 12 percent decline in the MSCI Emerging Markets Index over the period shown in Figure 3. 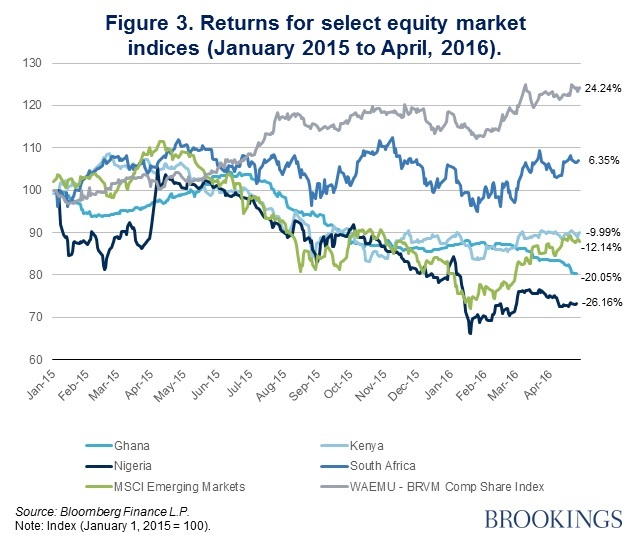 However, equity indices for Kenya, South Africa, and the West African Economic and Monetary Union (WAEMU) performed better than the emerging market index during this time, with South Africa and WAEMU even achieving positive returns of 6 and 24 percent, respectively. The WAEMU’s positive gains were driven largely by a robust performance from Côte d’Ivoire while South Africa’s rebound is attributed to its Federal Reserve’s dovish monetary policy stance and a recent boost in commodity prices. 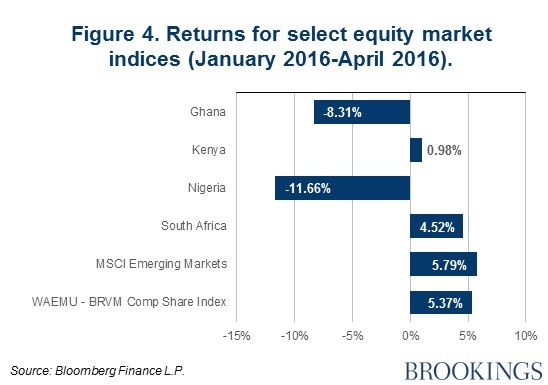 In fact, from January 2016 onward, nearly all equity markets have been trending positively (see Figure 4) due to a slight uptick in commodity prices—except for Ghana, which continues to suffer from economic downturn due to lower trading volumes, a weakening currency, and power shortages. Nigeria also continues to suffer from concerns over exchange controls, which have reduced access to dollars and key imported goods for businesses in some cases. 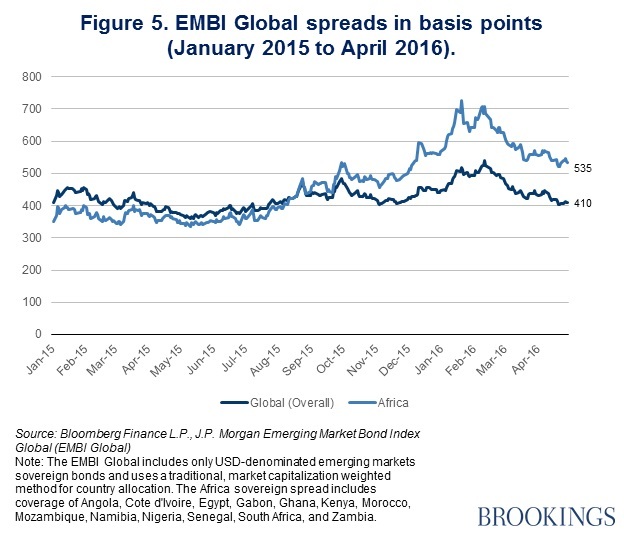 The Africa region’s bond index spread has widened by more than 100 basis points beyond the global spread since mid-2015 after remaining relatively consistent with (or slightly below) it until that point. On average, African bonds have yield spreads 5.35 percent above the U.S. 10-year Treasury bond rate, compared with the 4.10 percent of the global bond index (Figure 5). The growing African spread reflects mounting concern over the region’s vulnerabilities, but also spillover effects from the global spread, which has been gradually increasing since May 2015 as well. As seen in Figure 6, one country that has experienced a massive widening in its bond spread is Mozambique after it was revealed that the government issued an $850 million bond to purchase tuna fishing vessels, but instead used part of the funds to pay for military ships. Subsequently, previously undisclosed state-owned debt amounting to $1 billion or 8 percent of GDP was exposed, recently prompting the International Monetary Fund and the World Bank to suspend their lending. 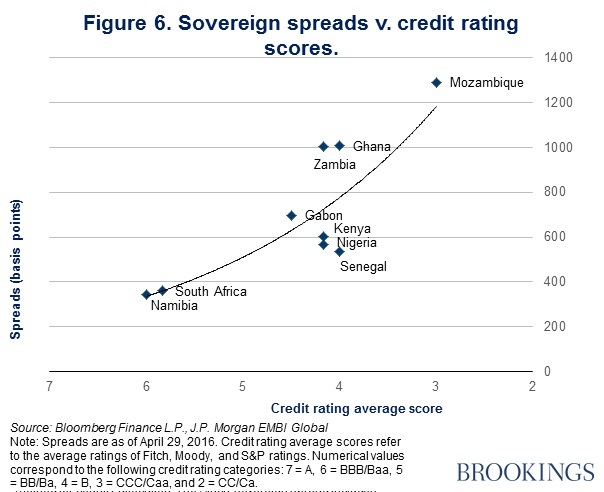 So far in 2016, several countries’ credit ratings and outlooks have been downwardly revised. Table 1 shows a list of select countries’ credit ratings as of April 29, 2016. Moody’s downgraded Gabon’s and Nigeria’s ratings from Ba3 to B1 at the end of April based on the likelihood of continuing low oil prices and their effects on these major oil exporting economies. Gabon’s outlook was assessed to be negative based on the government’s mounting debt (expected to reach 51 percent of GDP in 2016), decreasing government revenues, and slowing nominal GDP. Nigeria, on the other hand, was assessed to be stable since its strong fundamentals counteract the downside risks of deepening fiscal challenges caused by these external shocks. Moody’s also downgraded Zambia’s credit rating from B2 to B3 and changed the outlook from stable to negative based on Zambia’s increasing liquidity pressures and ongoing difficulties in financing the budget deficit, which has widened due to low copper prices, drought, and electricity shortages. Meanwhile, South Africa’s Baa2 status is currently under review by Moody’s for a potential downgrade. Its BBB- rating will also be reviewed by S&P on June 3, 2016. 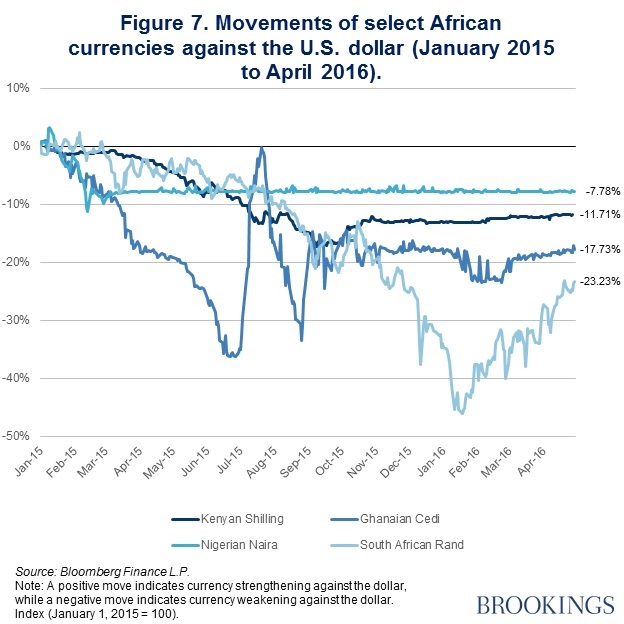 As seen in Figures 7 and 8, while in 2015 most African currencies declined against the strong U.S. dollar, in 2016, many currencies are rebounding—although they still remain at lower levels than in January 2015. For example, the South African rand has depreciated by about 23 percent since January 2015; however, this is up from a 46 percent depreciation as of mid-January 2016 caused by the sudden firing of South Africa’s minister of finance (and some uncertainty surrounding his replacement) in December 2015. Similarly, Ghana’s cedi has depreciated by about 18 percent since January 2015, but has gradually strengthened against the dollar following a volatile period in 2016 and a slump in January and February 2016. Meanwhile, after the Nigerian naira’s devaluation against the U.S. dollar in February 2015, the government tapped the country’s foreign reserves to stabilize the naira and introduced exchange controls. 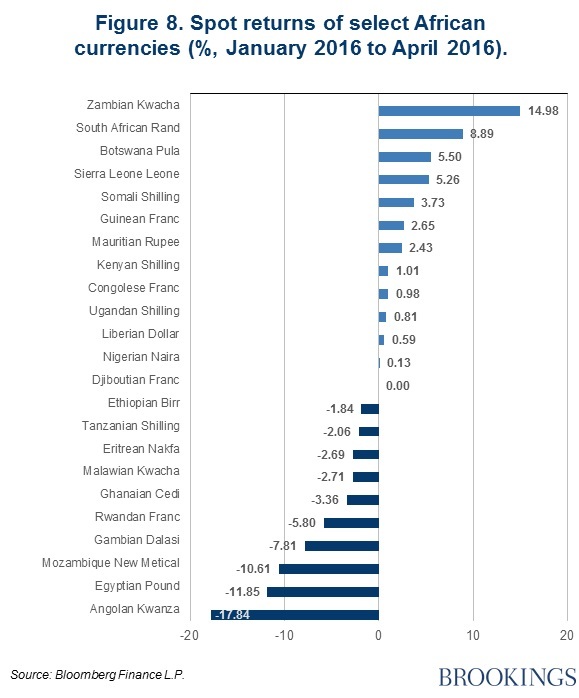 In Kenya, the shilling has remained fairly constant against the dollar due a decreasing trade deficit, robust remittance inflows, and supportive monetary policy. Countries are continuing to adjust their monetary policies to address inflationary pressures, and, for those countries with external debt denominated in U.S. dollars, depreciation will increase the cost of repayment.